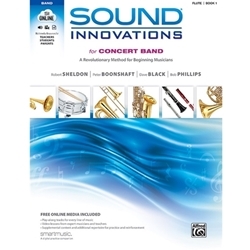 Sound Innovations for Concert Band is a revolutionary, flexible, and comprehensive method that combines time-tested educational concepts, input from thousands of teachers, and advances in modern technology. A logical sequence, clean page layouts, clear goals for each exercise, and uncomplicated explanations combined with instrument-specific MasterClass videos and varied accompaniments will foster better comprehension and improved execution of technique. The content is organized into levels, providing benchmarks, assessment indicators, and intermediate goals. With SI Online, adjust the pacing and focus of your teaching any time during the semester to address differentiation and the unique needs within your classroom. Also, access streaming audio and video content and explore the wealth of additional repertoire available online. Learn more at www.alfred.com/SIOnline.